Spread out over the past 6 weeks I have shared with you an extensive series of reveals on my laundry room redo. In fact there have been posts spread out over the past year as this projects has unfolded. This week I hung a final piece of art on the wall when I completed my paper birch tree shadow boxes. But in all of these post what I haven't elaborated on yet is, "What are the mistakes?" Many people have commented on how much they like my redo and that they are also planning to upgrade their laundry. I thought it would be helpful to share the mistakes so you can avoid them. 1. Watch diagonal lines in floor patterns when your house isn't square! 2. 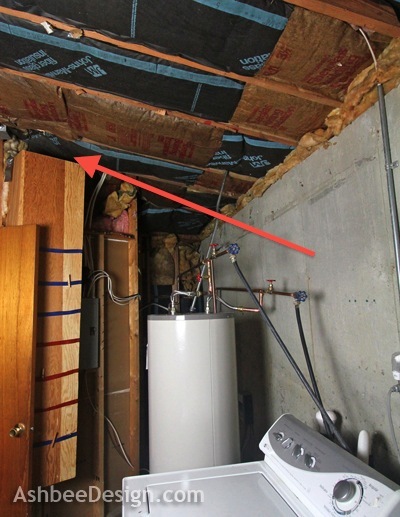 Check insulation in hidden spaces. 3. Spend time thinking through changes suggested by the contractor. 4. Hold back money until the job is done! When we built our house back in 1978 I did something radical. I added a 45º angle in the foundation. This was major and the contractors were floored by the concept of creating a home with angles that weren't all 90º. They didn't have concrete forms for 45º. The diggers didn't have tools for measuring 45º. As a result the major bend in my home is in reality 37.5º. And my laundry room is situated at that juncture. It hasn't made much of a difference however I picked a floor pattern for the congoleum that has a 45º tile line in it. Yup! The back wall is fine but the washer and dryer swing out and are flush with the wall behind and it is at 37.5º. See how they don't align. Yes, that is a tad OCD of me but it didn't need to be that way. I could have just as easily chosen a pattern that didn't have the 45º lines. So watch those floor patterns! The laundry chute was not a new addition to this renovation. It did exist in my old laundry room. Remember this before shot? Big change! If I had looked up there I might have noticed that the top of the laundry chute is above the insulation in the unaccessible attic space above the scissors trusses. When it is cold outside that laundry chute is a direct conduit to that cold space and it works like a chimney in reverse. Cold air pours down. I could have just insulated around the top of the chute by removing some of the ceiling insulation before sheetrocking. Problem would have been solved. We have incredibly hard water here and it is filled with iron crud. The filters in the inlet hoses of my washing machine were always clogged with grit and every 2-3 weeks I would have to pull out my washing machine and clean them out. 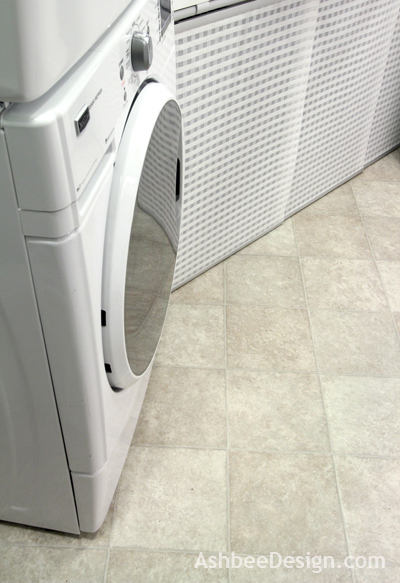 One of the items designed into this re-do was an open panel behind the stacked washer and dryer through which I could easily access the hoses on the back of my washing machine. I had design a full open space in the wall that backs up to the utility area. The contractor recommended that instead I get a box that frames into the wall for attaching the dryer hose vent allowing the dryer to be tight to the wall. I thought that was a good idea and wasn't paying attention when the area got framed in. I was measuring everything for the dryer but didn't notice the opening for the washing machine was getting drastically reduced. And when all is done and the washing machine delivered, I can't access the hoses from the back. The space is just too tight. My original plan would have worked better. I did have a water filtration system installed so hopefully it will no longer be a problem. I've got my fingers crossed. I know you never pay the final payment to a contractor until he has finished everything. I still had the last payment in hand when the contractor suggested that instead of having the counter tops made, he would make them for me. The added cost to the project would be the fourth and final payment. So I paid the third payment (my mistake!). We had supply issues with the laminate and when it did arrive, my contractor no longer wanted to finish the project. Although I hadn't paid him that last bit, he had been paid for what he had completed and he refused to finish the job. Lesson learned, always owe the contractor! David and I had to build, cover and install the counters, finish installing the last cabinets, install the hardware, do the trim work, build and install shelves. The contractor should have done those. Learn from my lesson! Hopefully these lessons will help you if you do this type of renovation! 1. The BIG Project • Laundry/Utility/Pantry - A post about the plan! 7. Discombobulated • Laundry Room Update - September great progress but everything is still in the family room. 8. 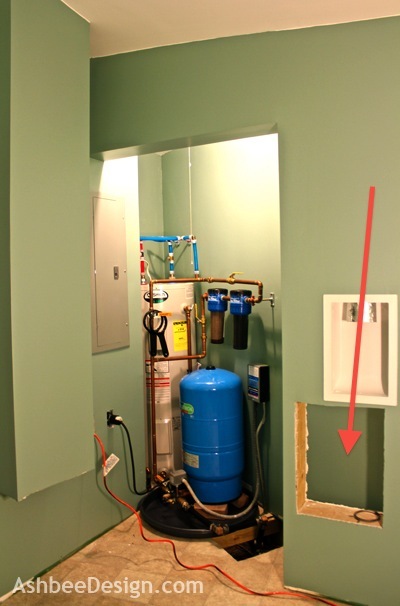 Laundry Room Update • Major Stall - Contractor disappears! 10. Constructing Countertops - Marji and David take over and it does become a DIY project! What a nasty your contractor was to not finish the job. He certainly wasn't looking toward any further work as you will never hire him again. What a nuisance that those things went wrong. 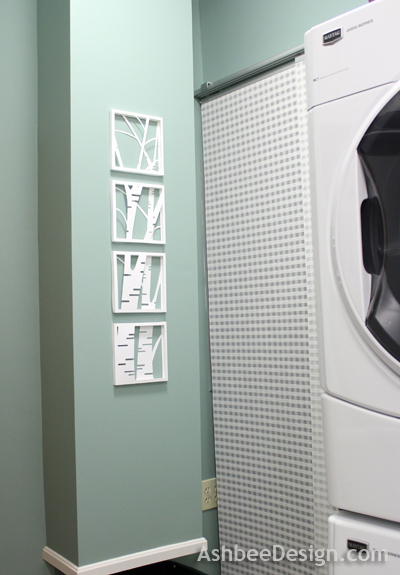 Overall the laundry room looks great, but it is a pity there were the problem areas. I was surprised when the contractor walked. He had been such an excellent resource and I always liked his work. But you are right, I won't hire him again.